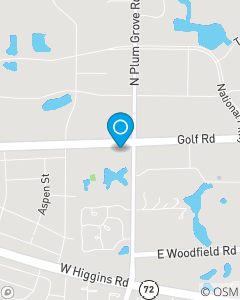 Two story brick bldg with big white pillars on Golf, near Plum Grove, close to Portillo's. 30 years of State Farm experience!Licensed, professional and courteous team.Illinois State University graduate.Chartered Property Casualty Underwriter (CPCU) designation.Schaumburg Business Association (SBA) member. We are here to "help life go right!" Our goal is to make every customer happy with our quick, professional and customerfriendly service!